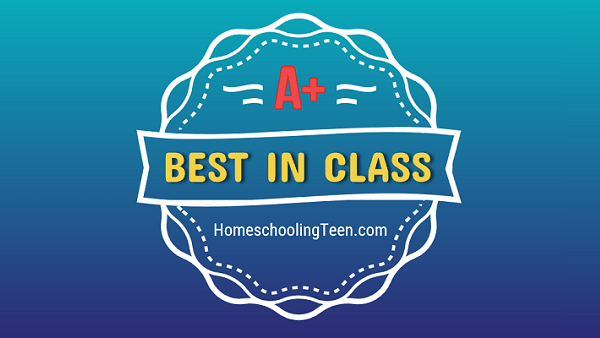 The editors and students at HomeschoolingTeen.com judge their favorite curriculum, books, and educational materials based on the following qualities when selecting the Best in Class Award. Is the material well-crafted, well-written, and accurate in detail? Is the format or user interface understandable and easy to follow? Is the content engaging and enjoyable to read (or watch, or listen to)? Is the design and layout visually appealing for a teen audience? Does it have a timeless quality that isn’t based on the latest fad? Does it cross age barriers to interest other family members? Does it require minimal preparation on the parent’s part? Does it provide a unique approach to the subject matter? Does it reflect a meaningful theme and a memorable style? Does the material nourish the intellect and inspire the imagination? Does it broaden a student’s horizons and offer new insights? Does it accommodate different learning styles? Does it include supplemental information / enrichment activities? Does it present excellent content at a reasonable price? If applicable, is a Biblical worldview integrated into the material, or does it emphasize worthy characteristics such as traditional values and moral standards? Click here to see the list of Best in Class Award recipients.